distribution Statewide, though more widespread in the southern half of the Coastal Plain and southeastern part of the Piedmont. Of spotty occurrence in most of the Piedmont and mountains, and the northern half of the Coastal Plain, though perhaps occurs in all counties. abundance Generally widespread but uncommon in the southern half of the Coastal Plain, perhaps most numerous in the Sandhills. Rare to uncommon in the northern Coastal Plain and in the eastern Piedmont, and generally rare farther westward. Even though it is not a rare species, our highest one-day count is just 6 individuals. flight In the Coastal Plain, generally from late April or early May to late November. Flies at least from mid-May to mid-August in the Piedmont and in the mountains, sparingly to late September and early October. habitat Mainly small to medium ponds, including natural ones such as limesink ponds and Carolina bays. behavior Most often seen patrolling back and forth over a pond. At times seen over dry land, but best looked for over a pond/small lake. comments Males, with their bright red abdomen contrasting with the green head and thorax, are among our most beautiful and easily identified dragonflies. Its large size also adds to its striking appearance. 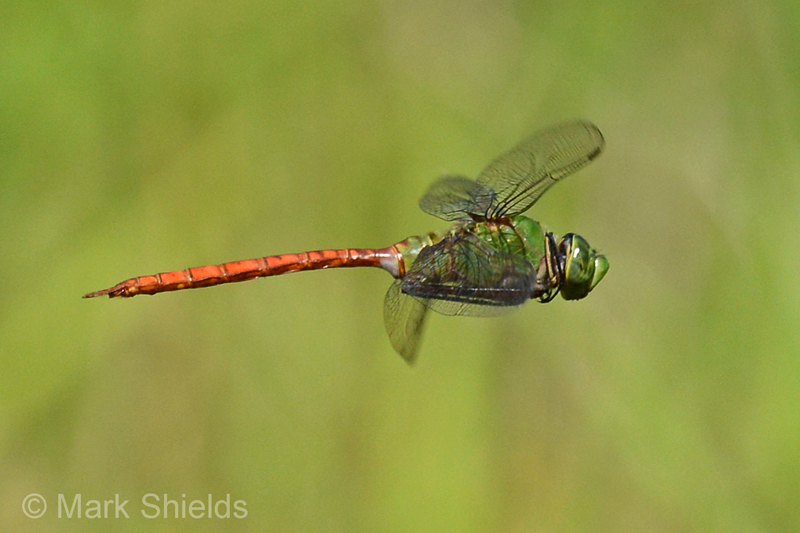 Females and immatures can easily be confused with Common Green Darner, and probably cannot be safely identified while in flight. Comment: Jackson, 2018-06-25, Pond beside Breedlove Road, 5 km northeast of Cashiers - First record for county.